A stunning area for autumn larch foliage, the easy trail around one shore of Moraine Lake is a must-hike for photographers and lovers of epic scenery in the summer as well. There are lots of opportunities for outdoor adventures here, including kayaking in the aquamarine lake and longer backpacking treks into Consolation or Larch Valleys or across the Wenkchemna and Fay Glaciers around towering Mount Bowlen. It’s not difficult to find epic photos of the glacial lakes of Alberta — especially the easily-accessed shores of Lake Louise. Although it’s a tad more out of the way than its well-known neighbor, Moraine Lake is also well known amongst shutterbugs, especially during the larch foliage season. You can expect crowds here, especially on the weekends, but that doesn’t mean that Moraine Lake isn’t worth a visit. On the contrary, the lake is stunning — and if you can time your trip early in the morning or on a weekday, you can still enjoy a good amount of solitude along the shoreline. This short hike begins at the edge of the large (and often overfull) parking lot for Moraine Lake. The Moraine Lake Lodge is situated here, and the complex has cabins, a small dock for kayaks, and a cafe and restaurant. If you’re just here for the views, climb up the short and steep Rockpile Trail to the incredibly aptly named “Rockpile,” a prominent collection of boulders at the edge of Moraine Lake that is one of Canada’s most popular photographing locations. The view from this vantage point some 80 meters above the shoreline is known as the “20 Dollar View,” due to it gracing the reverse side of that Canadian denomination from 1969-1979. In fact, you may not know it, but there’s a good chance you’ve already seen Moraine Lake in some digital form. The lake has been featured as background images on Google’s Android and Microsoft’s Windows 7 operating systems, as well as on Blackberry and Palm smartphones. Walk straight toward the lakeshore to follow this route. You’ll pass the kayak docks as well as several of the Lodge’s cabins. At about 0.1 mile, the Larch Valley Trail heads off to the right. Pay attention to restrictions in this region — when we visited, it was actually prohibited to hike that trail if you were in a group of less than four people, due to bear activity … which was definitely the first time I’d seen a sign like that! From here, the trail generally follows the contours of the northwestern shore of the lake on a well-worn and mostly level dirt path. Keep an eye on your feet for tree roots, which are likely to trip up those of us who tend to become distracted by enchanting terrain. Otherwise the trail is very easy hiking. You’ll have plenty of opportunities to get right up next to the lake itself to carve out your own unique photo-take on the landscape … or you can just enjoy the landscape for what it has to offer and never snap a single photo. It’s about 0.9 mile to the end of the established trail, which stops on a boardwalk near a wide braided stream that flows into the lake. A technical mountaineering route continues on from here across Mount Bowlen and into British Columbia, where climbers can enjoy a stop at the Niel Cogan Hut — Canada’s highest permanent habitable structure. Return back to the trailhead the way you came in. Very good. The trail is partially paved and partially on a single-track trail that is very easy to follow. The Moraine Lake Lodge is right next to the trailhead, although it is significantly more upscale than camping. The nearest tent camping is at Lake Louise. There are 206 reservable campsites, and the campground is generally open from the end of May through mid-September. From the Trans-Canada Highway, exit at Lake Louise Drive and head west toward Lake Louise. 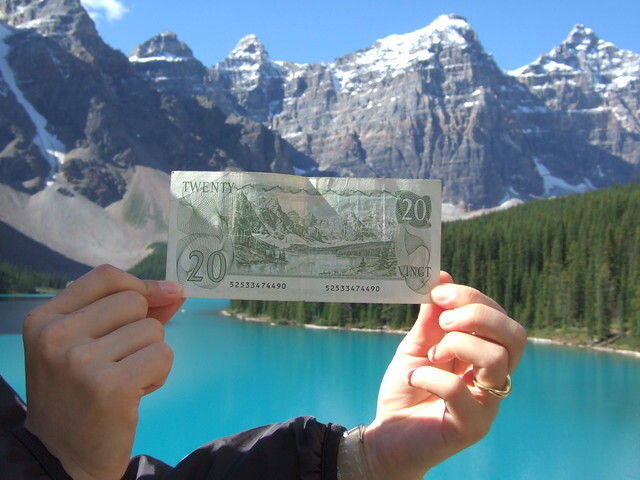 In 2.2km, pass the village of Lake Louise and turn left onto Moraine Lake Road. The road ends at the trailhead in 12.2km. Note that Moraine Lake Road is generally closed from September until May.